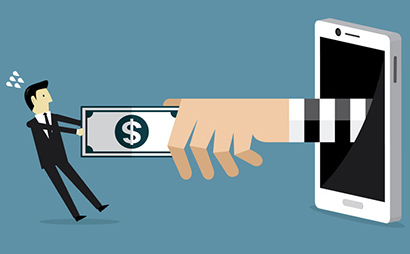 In our modern age, when information technologies are developing very rapidly and covering all large areas around the world, a new type of scam has emerged. This method is now considered one of the most demanded because there are a large number of various schemes and methods, with relatively low information support and network skills of Internet users. Many people daily visit various Internet resources in order to obtain the necessary information. At the same time, many Internet users are almost always faced with a variety of offers that look very attractive and profitable at first sight. Most often, this kind of offers are very similar to each other – they offer to earn money without much effort and quickly enough. Because of this, these proposals quickly find their victims. Numerous and experienced scammers invent new and more cunning ways to deceive trusting and unsuspecting people. It is very important to know that everything costs money. Today, scammers are very creative, so in order not to get caught on the many tricks on the Internet, you need to know and understand the basic methods that fraudsters use in their scams. And it will be even better if you yourself scam them. So, a scammer gets scammed: how to do everything right? 1. Marital speculators. Scammers of this type, use photos of beautiful women and men to search for naive victims who will transfer money for the so-called “potential soulmate”. Typically, this type of scam is present on numerous dating sites. The task of fraudsters is to make the victim fall in love without meeting them. Each of them has its own methods, but they all have a lot in common. Usually, they don’t address a victim by name, don’t respond to personal questions, don’t post joint photos with children or family, and so on. Their messages can often be about anything, but they will surely be richly “decorated” with compliments and confessions in the most tender feelings. In communication, they use standard sets of phrases about love, loyalty, and seriousness of relationships. Professionals are never in a hurry – they can spend weeks, months on victims. As soon as a victim falls in love, the second stage begins – defrauding money. The victim of fraud in love will believe any fictional story and send any amount without even asking for evidence. This is the most reliable, albeit lasting method of deception. How to outwit a romance scammer? To avoid becoming a victim of fraud, always follow the simple rule – never give your money. Any request for monetary assistance is a signal for an immediate breakup of relationships and the cessation of all kinds of contacts. It is better to be deceived in your feelings than to spend all your savings on a scammer and get into debt trying to “help” him or her. By the way, you will never face Romancecompass scam because the site is carefully checked for any kind of scammers. 2. Phishing. Here we can note a couple of options. In the first case, a letter comes from some organization, but a user doesn’t use the services of this site. It can be concluded that the letter is fraudulent and it must be deleted. In the second case, the user can use the services of this organization. Here you need to read the letter very carefully. If it has a request to enter credentials, then the message might be sent by scammers. Bona fide organizations never require logging in via a link in a message. Login and password are used only to log into your account. In addition, you can simply hover the cursor on the link, and the real address of the resource will be displayed at the bottom of the screen. How to outwit a scammer? If there are any doubts, then you can independently go to the resource of the organization from which the letter was received, without using the link. This can be a guarantee of circumventing a fraudulent resource. Don’t click on suspicious links. There may be malware to steal card data, passwords, and personal data. Moreover, don’t download anything on suspicious sites. If you stumble upon some site that looks suspicious, then leave it immediately because there may be a virus. 3. Social networks. In this case, a user receives a message from the network administrator, that someone wants to make friends or that you need to update your account. The user clicks on a link to a fraudulent resource identical to the original. After that, the user enters data that is sent to the attackers, and they capture it. How to report a scammer? Here you need to carefully review where the transition takes place because scammers can create domain names similar to the original. By the way, the same happens on dating sites, but you can be sure that Romancecompass has no scams at all. 4. Money changers. If a person uses electronic money, he/she may need to convert some currency. However, not all money changers will really provide this service. As a rule, if the service offers too favorable tariffs, then this is an alarming sign. Scammers lure people in this way. The user will transfer funds but will not receive anything in return. How to outwit a scammer? You need to apply only to proven services and don’t chase for great offers. Don’t tell anyone your bank card details. Number, expiration date, secret code, and passwords are not asked even by bank employees. Therefore, if a stranger allegedly wants to transfer money to you or offers something else but asks for complete card data, say goodbye to him or her. To transfer money, you only need to know the card number and the recipient’s name. 5. Fake online shopping. Every day, there is a new story about how a person decided to order goods online, but he or she faces scams. It happens when a seller just disappears after receiving money. How to scam a scammer? Don’t seek to buy anything at times cheaper. Otherwise, you will have problems. Ignore offers with a suspiciously low price. Most likely, there are scammers behind them. You shouldn’t agree to prepay or transfer money in advance for delivery. Thus, you will exclude the possibility of wasting money. 6. Contests and lotteries. It is a quite popular scam from India. You may suddenly receive a message that you have won a prize. It is not so important whether you actually participated in any competition or not. A scammer can come up with any story to lure money. He/she will promise to send a valuable prize but will demand payment for shipping or insurance. Of course, no gift actually exists. How to insult an Indian scammer? Don’t believe in magic prizes. If you know that you didn’t participate in any lottery, how could you win? Alternatively, you can the name of the organization and check it on the Internet. Indian scammers write various nonsense, in which you shouldn’t believe. 7. Scams via messages. It often happens that a person wants to download a file on the Internet and it asks him to write a phone number to start the download. The same situation may be when opening a video or program. A message will be sent to you and you will need to reply to it. After sending a reply message, money will be stolen off from the balance. How to outwit a scammer? Such a case is common, so don’t write your phone number and don’t respond to such messages. Thus, a scammer will be scammed.